The report, which was produced by Point Topic, notes that nearly three quarters of all net adds in fixed broadband subscribers came from East Asia, which in turn was mainly driven by continued growth in China that added 15 million broadband subscribers during Q3 2017 (this is from a total combined quarterly increase of about 21.27 million). China remains hungry for ultrafast FTTH connections and in keeping with that they added 68.7 million subscribers over the past year to Q3 2017, which constituted a whopping 85% of the global total FTTH net adds in that period. We should also point out that China aren’t the only ones planting FTTH, Vietnam added nearly 900,000 in FTTH and also saw an 11% quarterly growth in their total fixed broadband customer base. Unsurprisingly East Asia as a whole thus took a 73.79% share of the quarterly net adds for all technologies, which is well above the 15.72% for the whole of Europe and 2.38% for North America. 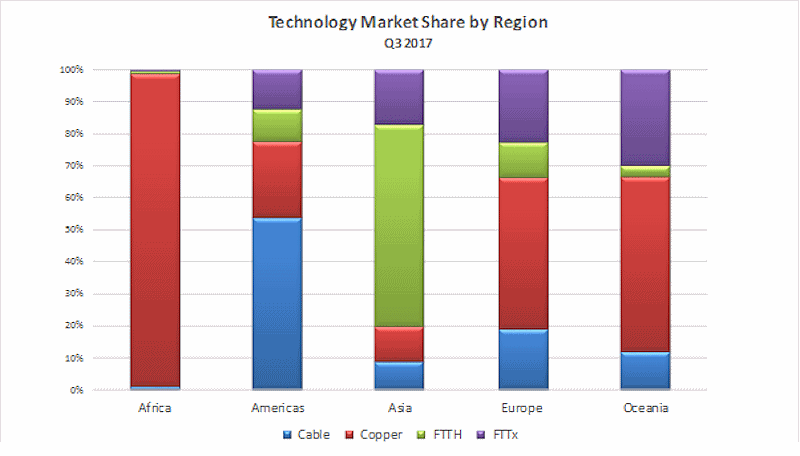 Meanwhile more mature markets, such as Western Europe, continue to witness the cannibalisation of older and slower copper ADSL lines by faster FTTP/H and hybrid fibre (FTTC) or Cable (DOCSIS) services. In terms of the annual change, the number of copper lines globally fell by -6.3%, while hybrid FTTx/FTTC lines also dropped -5.4% and wireless slipped by -1.5%. On the flip side Cable networks, like Virgin Media, grew +6.9% (DOCSIS 3.1 will help them to stay competitive) and FTTH/P services surged by +30.4%. Once again the influence of FTTH/P services in Asia is obvious when looking at the technology split by region, although it’s worth remembering that more mature markets (e.g. Europe) built their copper networks a long time ago, while newer markets are building lines for the first time and naturally pick fibre. The current trends will probably continue for a couple more years as China continues to dominate. 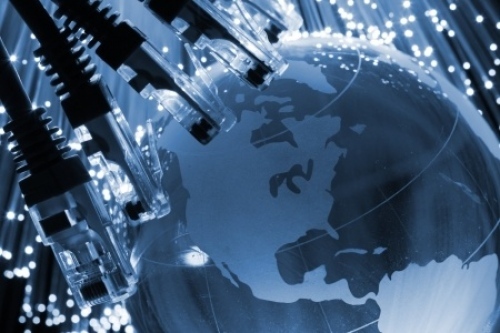 However, European countries are increasingly switching their focus to “full fibre,” which is likely to become more obvious as the UK and other countries ramp up their deployments. The UK is of course playing a game of catch-up and many EU countries have considerably more FTTH/P in the ground.